things have felt extra busy around here lately. shaun finished his last quarter of school ever and graduated, yay! we had a big party with friends & family to celebrate. and it's been so nice to get to spend more time with him since he isn't always busy doing homework and studying for tests. i was totally inspired by this card from the amazing and talented julie ebersole. i love the woodgrain and the inlaid effect so i recreated it with the savvy thanks script die and cracked pistachio distress ink. first i cut the wood veneer paper to cover my card front. then i die cut the thanks right where i wanted it. i removed the thanks word and inked it with cracked pistachio using the ink blending tool. 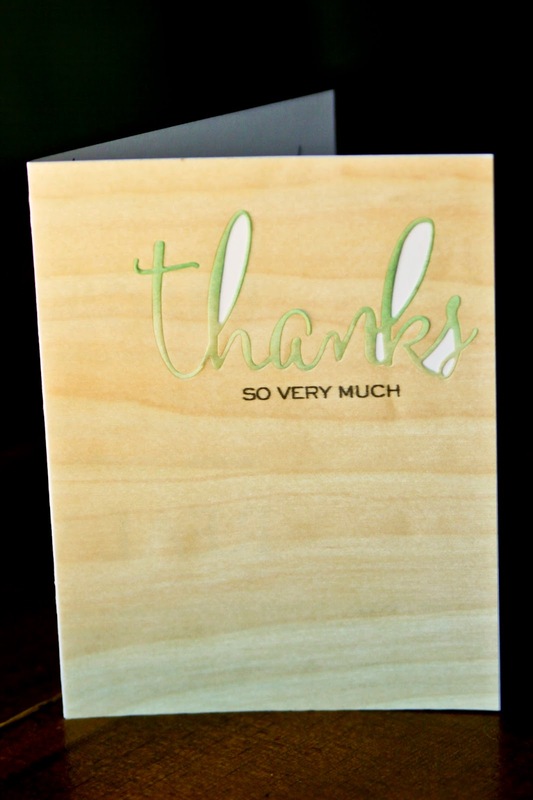 i adhered the larger rectangle of wood veneer to my card and adhered the inked thanks word back where it was cut from. a glue pen works great for this. underneath i added the "so very much" message from the mama elephant happy everything stamp set in versafine onyx black ink. ta-da! all of my supplies are from my favorite place to shop, ellen hutson and you can find them below. I love these cards lady! The wood veneer is so cool!